option 1 > A simple stand alone Hellschreiber beacon generating a repeating stored message. option 2 > A PC or Tablet USB controlled Hellschreiber sender. option 3 > A full Audio and USB Hellschreiber interface. The PIC16f1615 microcontroller is preloaded with SCRIBER V2.x software (currently v2.1). 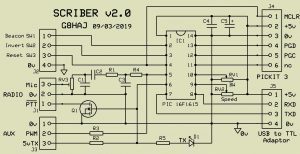 This version of Scriber has a UART polarity serial interface (idle=5v) and requires a USB to TTL module for the serial interface to a PC or Tablet. Additionally, the analogue interface levels are changed to suit a MAX9814 agc microphone amplifier module ( 1.25v bias, 0v to midrail span). Otherwise, the software is the same as version 1.0, please refer to the Scriber v1.0 page for a full description of the software. SW1 & SW2 – 2 single pole toggle switches for Beacon and Invert functions. Fit the IC1, ensure it’s the right way round and observe static precautions. Fit RV1 & RV2, either presets or 16mm linear pots, any value from 5k to 50k is fine. At this point Scribers basic functions can be checked, apply a 5volt supply to J5, the supply current should be around 5mA. Turn both presets fully clockwise and momentarily short pin1 (B) of J2 to 0v, the TX LED should light for around 20 seconds whilst Scriber sends it’s beacon message. If you’ve a scope, pin 2 of J3 (PWM) will have 31.25KHz PWM on it & pin 4 of J4 will have ‘digital’ sinewaves whilst the beacon is active. If all’s well the rest of the components may be fitted or if only the PWM output is required for optical comms none of the rest of the components need be fitted. Download and install a serial terminal program – ‘Termite‘ is very good and easy to use. Connect the adapter to the PC via a USB cable and start ‘Termite’, if all is well you should have a new COM port listed. Select the new com port and set it to 9600 baud, 8bit, 1 stop & no parity. In Termite’s settings – select ‘append CR’ and deselect ‘local echo’. Fit a jumper link between TXD & RXD pins on the adapter to test remote loop back. In Termite, type something on the bottom line, press enter and if everything is OK, the text will echo back in the box above. Remove the jumper and connect the 0v & 5v outputs on the adapter to the corresponding pins on J5 of Scriber. Plug the adapter into the USB and reset Scriber (momentarily short pin 3 of J2 to 0v), You should then get Scriber’s welcome message and a prompt on screen. 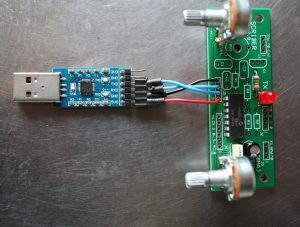 Download and install SPECTRAN , connect Scriber mic output (J1 pin 3) to the mic input of a PC, enable Scriber’s Beacon (connect J2 pin1 to 0v), Scriber will continuously send it beacon message centred on 800Hz – experiment with Spectran and Scriber’s controls until you are familiar with their effects. ( see Scriber v1.0 for more information ). Scriber can also accept a MAX9814 agc microphone amplifier module to provide both voice and hellschreiber output. This may be useful when Scriber’s output is being fed into the Mic socket of a radio or to enable the use of a PC headset. The MAX9814 chip is available on a tiny module from Amazon, Ebay or Adafruit with an on board electret microphone capsule. The capsule may be removed and an external microphone used. The module provides several gain and compression options. The 20dB AGC range ensures a constant output level. The module is interfaced to Scriber using J4 on the Evaluation PCB. Port J4 can also be used to incircuit program the microcontroller, if both uses are required it’s best to use a plug and socket arrangement. Scriber has an internal 300Hz to 3KHz digital bandpass filter with hf pre-emphasis optimized for speech. An external PTT line is used to select voice transmission. There are 5 single row 0.1 inch pitch connectors positions labled J1 to J5 on the PCB, they may be populated with either pins or sockets and may be fitted either side of the PCB to suit the application. All the connectors are on a 0.1 grid for easy use as a daughter board in a larger project. 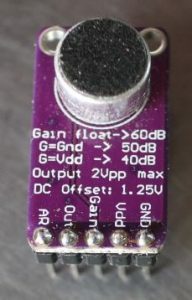 pin 1 – +5v power, <10mA + any current drawn from J3. program the chip this may be used as an analogue interface with the following pin functions. It may be connected directed to Maxim’s MAX9814 agc’ed microphone amplifier chip. note – The analogue interface must be disconnected during in-circuit programing .